The validity of the performing arts as a medium is related to their resistance to be fixed. Contrary to what occurs with literature and cinema, per- formance practices cannot be converted into closed texts. Hence the impossibility of documenting them. Hence the frustration of semiotics in its approximation to the performance world. Hence too the interest in their study as an approach to new penomena in communications and creation derived from the network and implementation of digital technology in an artistic environment. 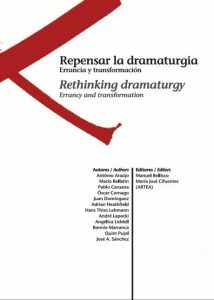 When speaking about dramaturgy and not about text, we think of an intermediate space between the three factors that make up the theatrical phenomenon: theatre, acting and drama. 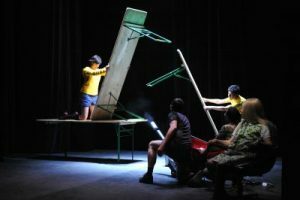 Theatre is the place of the spec- tator (social or performance space); performance («actuación»), the place of the actors (expressive or dynamisation space); drama is the place of action, whether codifiable or not in a text (formal or construction space). And we can then discover how in different epochs and contexts, from each one of these places, the other two have been submitted to criticism and transformation. And we can also understand that dramaturgy is a place somewhere in the middle of these three places and therefore at the same time nowhere. It is a space of mediation. We know the history of Khmer Rouge and the atrocity of Camboya’s killing fields. But how to place one self in front of a person who suffered torture and survived? How to place oneself when this person does not only exhibit her/himself in her/is sorrow, but in a fictional work, showing how s/he daily becomes image-movement, body-movement in performance? There are different elements in the performance dispositive which break spectacularity. First one is the home low resolution colour videos: there is no artistic aim in those videos, they are row material. They can be aesthetically disappointing, but reinforce the perception of the piece from the experience point of view. Question: ¿doesn’t it reduce the pleasure that for the dancer means to be on stage? But it is not intended to produce a spectacular performance with own life’s material: performance is outside, it is indicated, in a different place. Now it is about showing. Second documentary break comes with the director’s irruption: he explains that the protagonist is one of the last live archives on Camboyan Palast dance. The only dance to be shown in spectacular format happens at the end of the piece, and it is shown under a low intensity light, as if it where performed inside a museum showcase. On the other hand, the piece begins in a very direct way: the three performers in front of the cameras that register a close-up of their faces while they tell their terrible experience in the fields. The use of video-cameras allows distance, avoid direct gaze: performers don’t speak to the audience as individuals, they don’t look the spectator to the eyes, they look to the camera. So emotion is banned, as well as sentimentalism, which would make impossible the continuity of the stories. First testimonies are given by the younger dancers. Master appears later. She is the live archive. She keeps teaching, correcting. At a certain point, she says that her daughter (in her fifties) must still learn a lot. She had lost her husband and her own daughter in the field. All her life since then became an attempt to recover what she had lost. But her mother, the master, has only one concern: make her dance. Mother indentifies life and dance, she yearn for the Palast. Dancing is coming back home. And probably on stage she feels at home. Keng Sen says that the process of creating the piece was a healing process. Performers can laugh, can enjoy doing on stage that which they like the most: dancing. After passing through the recounting of his painful experiences. Do we see them as artists or as victims? It is impossible to separate both conditions. But where we not trying to stay in the present? Present is loaded by both conditions: we can not clear it. But we can try to place ourselves here and now, in our condition of persons able to speak and able to communicate with the others, exchanging experiences, translating lives.